I feel like we did something good for the planet on Wednesday at the Wilderness Certification Program. We began the day with a short lecture on habitat restoration and enhancement. Since most funding for these projects comes from Federal, State, and local agencies, there are jobs for ecologists, landscapers, and engineers. The process is pretty straight forward. 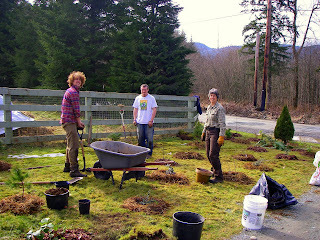 We got to practice restoring habitat in the front of the farm, where a lawn has been for many years. By digging holes in the grass and transplanting 31 native plants and trees, we recreated a biodiverse section of Alderleaf. Some species we put out there: Paper Birch, Evergreen Huckleberry, Salal, Red Alder, Sword fern (to name a few). The placement of each plant was decided based on the plant's height as well as its sun and moisture requirements. The second half of the day we learned about sustainable forestry. It was stressed that the number one goal of forest stewardship is to conserve and maintain biological capacity and diversity. We learned that it is very possible for humans to have an active role in the happenings of the forest and not decimate its health. The final part of our day was spent transplanting baby western red cedars in conifer- lacking areas of Alderleaf's forest. Thursday was an absolute blast. We studied search and rescue techniques in tracking, as well as tactical criminal tracking. We met up at the Startup Sandbar and built a flint and steel fire in a small cedar grove. Leaving Jason to tend the fire, we went and followed the trail he blazed earlier that morning. We had to interpret his behaviors on top of following his trail to the end marker (a beaver chewed stick). The character Jason played was a portly, drunk fisherman who casted in numerous places along the banks, drank a beer, and excreted in the bushes! None of us smelled the excretion to make sure it was him. After lunch we trailed each other...tactically... armed with super soakers! I was the first tracker to trail Dixie the outlaw. We set up in the basic diamond formation, me leading, Jase and Jason C. the flanks, and Jason K. the controller. The idea is the lead follows the trail while the flanks (only ones with super soakers) keep their eyes up to see the bad guy. In this particular case, the outlaw was too well camoflauged and witty for the trackers. Dixie sprayed me right in the back from a sand bunker twenty feet to the left. My flanker didn't even see her! On Friday we welcomed back Karen Sherwood, expert ethnobotanist. She taught us how to weave cattail mats, which can be utilized as seats, mattresses, and shelter walls. Cattail leaves are somewhat thick, soft, and pliable. We began by using a basic 3 braid method to weave the edges. After we had two equal length braids, we lined up leaves alternating earth end, sky end, earth end, sky end... We then took our Oceanspray wood weaving needles, tied some sinew to them, and shoved it through the edge of each leaf and the far braid. We did this with a single piece of sinew snaking back and forth down the mat. A very good day with lessons in not only weaving, but patience and the importance of workable, durable materials.